Credit: © CRG 2019. All rights reserved. The union of an ovule and a spermatozoon initiates a complex cell division process that will ultimately yield a new living being. In fact, all the body’s cells come from embryonic stem cells that must be divided, in a controlled and exact fashion, to give rise to proper organ and tissue formation in the embryo. However, the way that stem cells manage to control this accelerated division process without losing control, as occurs with tumour cells, and how division speed is adapted to the energy and molecular supplies they have at all times, are questions as yet unanswered by science. In this regard, a group of scientists from the Centre for Genomic Regulation (CRG) in Barcelona, led by the ICREA Research Professor Luciano di Croce, Sergio Aranda, lead author and co-leader of the study, and Eduard Sabidó, head of the CRG/UPF Proteomics Unit, have identified a molecular mechanism that regulates stem cell division speed. Their discovery, published in the Science Advances journal, could have a major impact on research into infertility. More specifically, the researchers have managed to describe a hitherto unknown function of a protein called AHCY that directly regulates gene activation in embryonic stem cells. 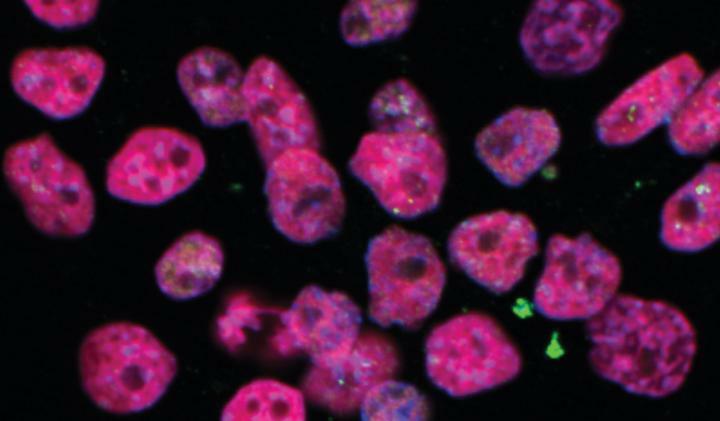 To this end, CRG scientists combined molecular, cellular and computational tools to describe what proteins are bound to the genome of embryonic stem cells. “We have managed to obtain a snapshot of the proteome (the set of proteins associated with the DNA) of the embryonic stem cells that has provided us with a great deal of unexpected data”, stated Aranda. “For example, we discovered the presence of certain metabolic enzymes, including AHCY, directly associated with gene regulation”, he added. These new findings not only establish AHCY as an activation regulator, but also point to a direct molecular association between nutrient metabolism, genomic regulation and the control of pluripotent stem cell division speed during embryonic development, and possibly in tumour cells. “The presence of nutrients is essential for the embryo to grow properly. Thanks to our study, we have identified, at molecular level, how this relationship between nutrient availability and embryonic stem cell division speed is established”, added di Croce. These findings could also have a major impact on scientific research into infertility, since, as the laboratory’s preliminary findings show, the AHCY protein performs an irreplaceable function in human beings. “We would now like to investigate a possible association between AHCY and defects during embryonic development in human beings, as this would enable us to provide tools for molecular diagnosis and the prediction of possible fertility problems in human beings”, explained Aranda.